Every girl loves a good shoe and we have found some great footwear that is in line with the aesthetic and integrity of our clothing brand- quality made goods with a unique twist made for real women. Our first match up is this gorgeous Bussola Shoe in Malmo Amber. Lousje has paired it with our Vanilla Tank Dress and our Pottery Blouse. This is a beautiful combination for a wedding or evening party and with their leather construction and soft cushioning, these shoes will have you dancing all night in comfort and style! Next up is a great closed toe option for those whose job or lifestyle requires a more protected silhouette. The Softino shoe in Fern Red is perfect for work and for play and is paired with one of our favourite Dresses from a classic collection, the Pipe Dress and a pair of C'est Moi Leggings. Our last pick is this Black Shoe from Rieker, Style 66759-00 and Lousje has paired it with our Black Crunch Leggings, a Twist Tunic in Chartreuse (shop for this one in-store!) and a C'est Moi Bamboo 3/4 Sleeve Scoop Neck in Black. Topped off with an Infinity Scarf from our scarf wall, this outfit has a pop of colour and the open toe slide in black is the perfect compliment to this sunny spring outfit. We hope you've found a little inspiration here for how to pair your pieces with the perfect footwear. 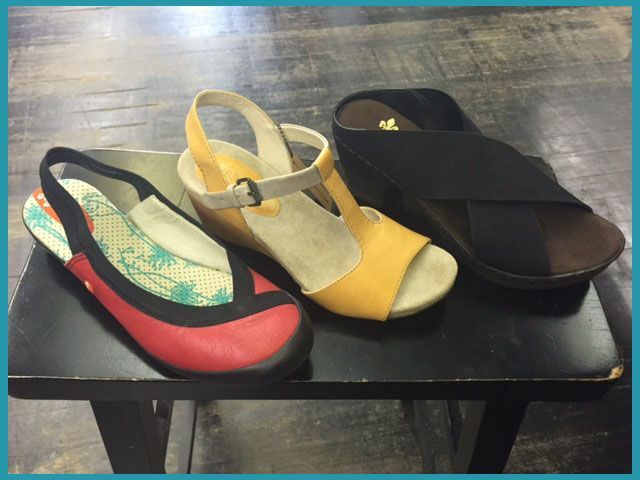 To help, the Boot Shop location at 46 James St. is offering 10% off to customers who mention this blog for the week of May 14-May 21, 2016 so hurry on over to find your perfect sole mate!